Are you tired of messy network? As the world embraces the increasingly faster data-rate network, IT managers felt great stress over the inability to organize and create a neat rack mounted environment. Patch panels allows the easy management of patch cables and link the cabling distribution areas, which paves the way for a refreshing new approach to a neat optical network. 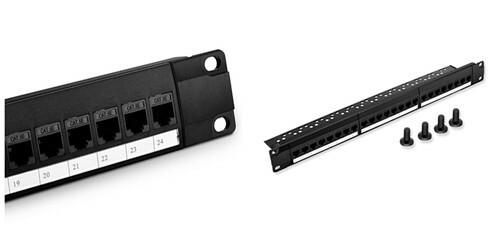 Patch panels also allow several cable connectors to be used (LC for fiber and RJ45 for copper). Today’s article will be concentrated on the illustration of the copper patch panels, especially cat5e patch panels and cat6 patch panels. The cat5e and cat6 shielded and unshielded patch panels are the commonly used copper patch panels on the market that are suitable for communication socket interconnection between equipment room, working area and crossover terminal connection. 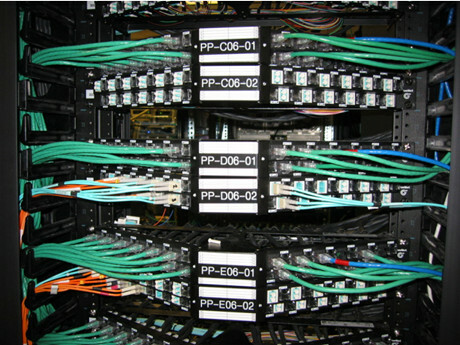 This patch panels use the copper patch cord to contains ports to connect and manage incoming and outgoing Ethernet cables. Besides the shielded and unshielded patch panels, copper patch panels include flat and angled types from appearance design. Flat patch panels help horizontal cable managers to organize and route cables into vertical managers. Angled patch panels are easy for cable termination and can improve patch cord routing. They serve as alternatives for management that need no rack space for horizontal management. The angled design increases rack density, managing high-density applications in one-fourth the area needed for conventional cable management systems. But angled panels are not good for cabinet installation due to the front depth requirements. Figure 1 shows the angled patch panels that allow cables to be mounted directly into the vertical cable manager. Angled patch panels do not need the additional cable manager to be installed above and below the patch panels, which makes them perfect for high-density areas. Next part will go on to talk about the cat5e and cat6 patch panels individually and specifically. Cat5e patch panels allows fast and easy installation and cable management to copper Gigabit switches. It is compliant with TIA/EIA 568 industry specifications and features both T-568A and T-568B wiring configurations. Cat5e patch panels are ideal for Ethernet network applications. Figure 2 displays the 24 Ports Cat5e Feed-Through Patch Panel, UTP Unshielded, 1U Rack Mount. This type of patch panel mount the patch panel using four rack screws. With the module design, feed-through module can easily achieve high density access. No punch down is required as well. Last but not the least, UTP network cable inserts directly, simple operation, to achieve seamless integration between cables. Cat6 patch panels deliver a steady 250 MHz connection to copper Gigabit switches. Ideal for Ethernet, Fast Ethernet and Copper Gigabit Ethernet (1000Base-T) network applications. Backward compatible with Cat. 3, 4, 5, and 5e cabling. Cat6 patch panels also meet the TIA/EIA 568 industry specification. Each patch panel terminates with standard 110 termination tools on the rear, which allows quick installations. Cat6 patch panels are available in 6-port and 8-port module groupings, in 8, 12, 24, and 48-port sizes. This article provided some detailed information about copper patch panels. When selecting between the cat5e and cat6 patch panels, you should consider the density supported (24 ports or 48 ports), shielded or unshielded and the compatibility with your racks. FS.COM provides the cost-effective cat5e and cat6 patch panels in 24 ports, 48 ports per 1U or 2U panel. If you have any interest, please contact us directly.